Welcome to Csgosmurfkings.com, the ultimate hub for all your CS: GO needs! At Csgosmurfkings.com , we provide ranked Counter-Strike Global Offensive accounts ranging from silver rank all the way up to The Global Elite rank. We provide ready-made ranked accounts for your convenience to make your CSGO experience the most enjoyable it can be. You can now choose any rank of your preference for extremely cheap rates. Buy a SMURF account to show off your skills to lower ranked players or you can buy a high ranked account to learn from the veterans of the game. We strongly believe one must be able to choose their own skill level inside the game and having bad teammates should not result in you getting your account to be a low ranked one and have to play with low skilled and below average players. All our accounts are boosted by clean players and unlike many other sites, we absolutely DO NOT use any cheats or 3rd party Softwares to boost our accounts. You can buy a silver account to play with extremely unskilled players, gold nova account to play with slightly better players or master guardian account to play with average players. We also sell high ranked accounts like Legendary Eagle accounts, which are usually used by quite skilled and experienced players and Supreme Master First Class and The Global Elite which are the toughest ranks in the game to reach and very few people can manage to get to those ranks. Once you buy a ranked SMURF account from us, you will not ever regret it. We have an extremely reliable helpline which will be willing to help you with any sort of problem you may face with your ranked SMURF account without any hesitation or delay, which can be reached at admin@csgosmurfkings.com. You can alternatively use the live chat feature for instant help by one of our representatives. Our delivery is extremely quick, sending you your CSGO ranked account to your email ID instantly after the payment is processed. You can pay via PayPal or CSGO Skins or CSGO case keys, whatever is convenient to you as we believe our customers should have the opportunity to choose how they want to pay for their ranked CSGO accounts. You can buy a ranked SMURF account starting from $8.99 only, which is a bargain rate and ranked prime accounts of your choice starting from $34.99 only. Our motive is to satisfy our customers and not blindly making a profit by selling ranked SMURF accounts to our customers. Our CSGO SMURF accounts are the most affordable out there and we don’t put a crazy price tag to our accounts. We refill our CSGO smurf accounts very often so we guarantee we will never be short of accounts. 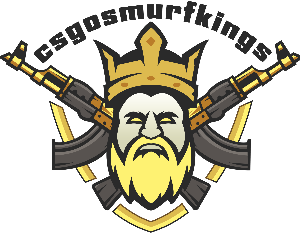 In short, csgosmurfkings.com is the ultimate combination of high-quality products and quick service. Buy your CSGO SMURF account today and show the rest of the world what you are capable of like never before! Good luck, have fun!